Thanksgiving food is the best food. 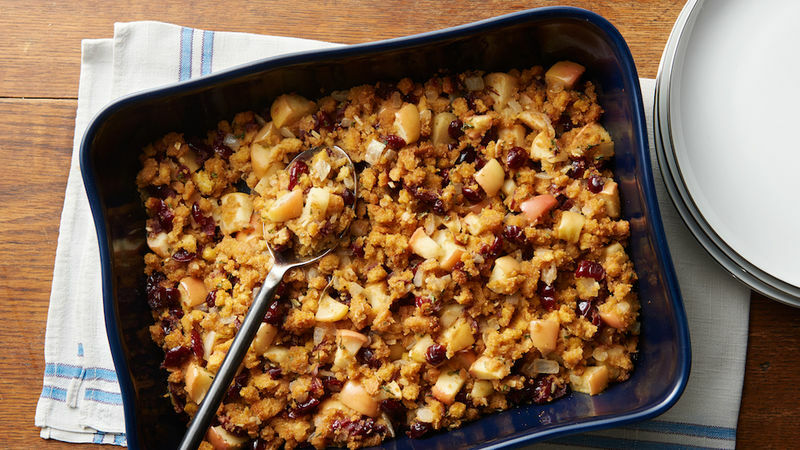 Case in point, these stuffing recipes that we’re truly thankful for. They are easy, impressive and the perfect sidekicks to your bird. Isn’t it called dressing, you might be wondering? Or have you only ever referred to this type of dish as stuffing? While the debate on the correct terminology is as infamous as the soda/pop debate, the terms “stuffing” and “dressing” actually refer to the cooking method. If the bread mixture is cooked inside the chicken or turkey, it is typically referred to as stuffing. If it’s prepared outside the bird, it is called dressing. But like many recipe names, what you call this dish may also be affected by the region you reside in. Northern states commonly refer to the dish as stuffing, while southern states call it dressing. Whatever name you use, we call all agree on one thing: this dish is totally delish. There are several common mistakes you should avoid when making stuffing. First, it’s important to completely dry out the bread you use as a base for your stuffing. If you make stuffing with soft, fresh baked bread, the stuffing will have a soggy, soupy texture (no, thank you). To avoid this, use stale, dried-out bread for the best stuffing. You can save time by using packaged mix as well. Another key to a tasty stuffing is adding the right amount of liquid. Adding too little stock will result in an overly dry stuffing. To find the right amount of liquid for your dish, add about a half cup at a time. For the best results, the bread mixture should absorb the stock without any excess at the bottom of the dish. Whether you’re an expert or a first-time chef, it never hurts to a get a refresher on classic dishes. Check out our How to Make Stuffing article for more pro tips you need to make a stuffing your family will love. Feeling inspired? We’ve got Thanksgiving recipes for you to try. From sweet potatoes to warm, tasty pies, you can be sure to bring a winning dish to your next family gathering this year.